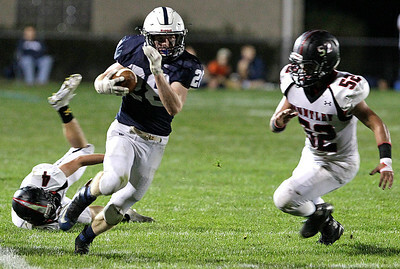 H. Rick Bamman - hbamman@shawmedia.com Huntley's Carter Beaudette gains six yards before being stopped by Cary-Grove's Collin Walsh in the first quarter on Friday, Sept. 23, 2016. 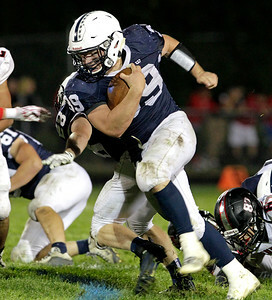 Cary-Grove won, 33-7. H. Rick Bamman - hbamman@shawmedia.com Cary-Grove quarterback Bobby Collins runs up the middle and is stopped by Huntley's Caleb Jones on Friday, Sept. 23, 2016. 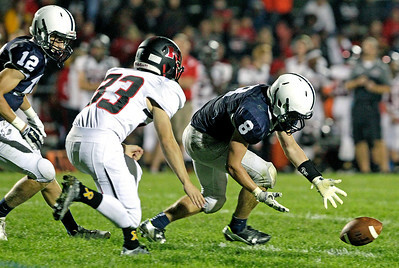 Cary-Grove, won 33-7. 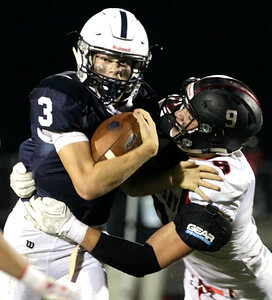 H. Rick Bamman - hbamman@shawmedia.com Cary-Grove hosted Huntley's quarterback Eric Mooney and running back Carter Beaudette confirm the play before the snap on Friday, Sept. 23, 2016. H. Rick Bamman - hbamman@shawmedia.com Cary-Grove's blockers Addison West (left) and Kyle Pressley block for Ryan Magel in the third quarter against Huntley on Friday, Sept. 23, 2016. H. Rick Bamman - hbamman@shawmedia.com Huntley quarterback Eric Mooney is smothered on a first down attempt by Cary-Grove's Zach Underwood (22) Max Skol (31) and Kevin Pederson in the second quarter on Friday, Sept. 23, 2016. 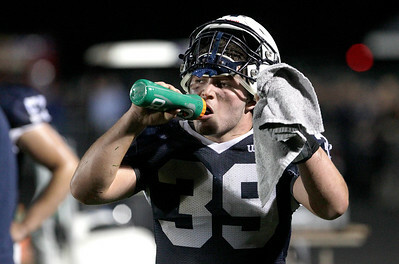 Cary-Grove, won 33-7. H. Rick Bamman - hbamman@shawmedia.com Cary-Grove's Tyler Pennington runs for a first down in the third quarter against Huntley on Friday, Sept. 23, 2016. Cary-Grove, won 33-7. 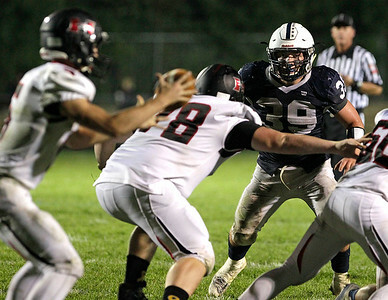 H. Rick Bamman - hbamman@shawmedia.com Cary-Grove linebacker Tyler Pennington gazes past Huntley lineman Andrew Pertzborn as he watches the ball land in quarterback Eric Mooney's hands on Friday, Sept. 23, 2016. H. Rick Bamman - hbamman@shawmedia.com Cary-Grove's marching band, color guard and poms perform before the game against Huntley on Friday, Sept. 23, 2016. 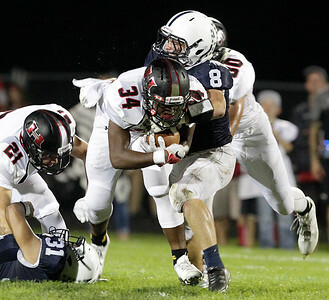 H. Rick Bamman - hbamman@shawmedia.com Cary-Grove's Kyle Pressley leaves Huntley defenders Cam'Ron Carrington (4) and Nicholas Dennis (52) in his wake enroute to his second quarter touchdown on Friday, Sept. 23, 2016. 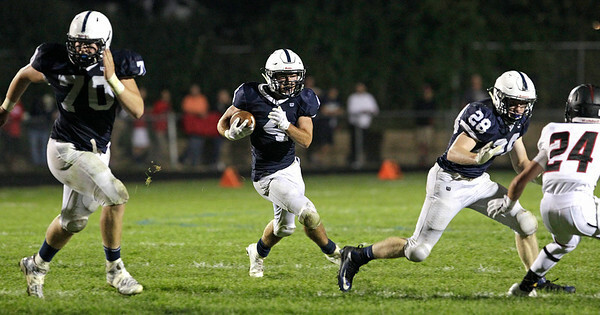 Cary-Grove won, 33-7. H. Rick Bamman - hbamman@shawmedia.com Cary-Grove's Tyler Pennington on the sideline during the game against Huntley on Friday, Sept. 23, 2016. 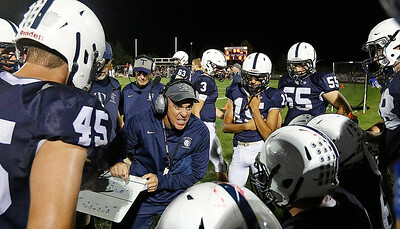 H. Rick Bamman - hbamman@shawmedia.com Cary-Grove head coach Brad Seaburg encourages his players on the sideline in the second quarter on Friday, Sept. 23, 2016. 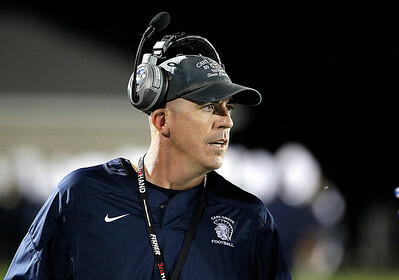 H. Rick Bamman - hbamman@shawmedia.com Cary-Grove head coach Brad Seaburg watches first half action against Huntley on Friday, Sept. 23, 2016. H. Rick Bamman - hbamman@shawmedia.com Cary-Grove's Collin Walsh (8) and Huntley's Emmanuel Miller (73) go after the fumble as Quinn Priester trails the play on Friday, Sept. 23, 2016. 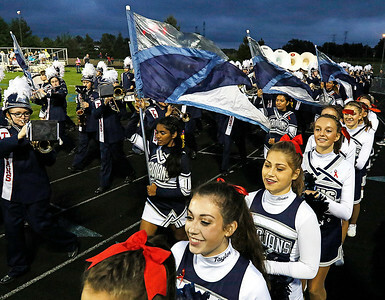 Cary-Grove's marching band, color guard and poms perform before the game against Huntley on Friday, Sept. 23, 2016.